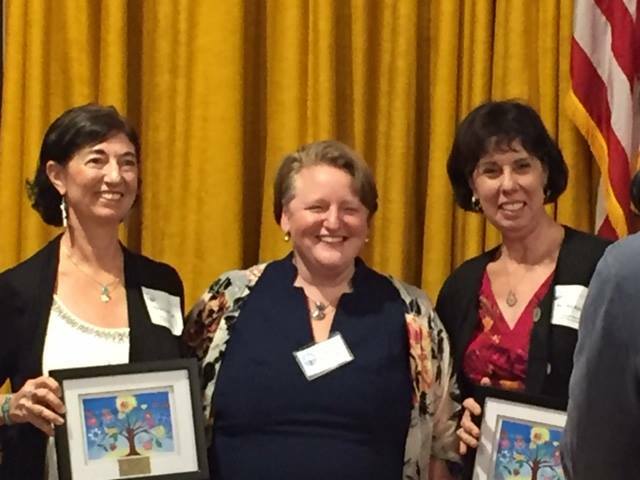 Barbara Malcom Katz and Karen Calmon Lukeman of Temple B’nai Israel were honored on October 7th, as our 2018 TBI Shem Tov Award recipients. The Shem Tov (good name) awards were created by the Jewish Federation of New Hampshire to recognize volunteers from organizations across New Hampshire who have provided outstanding service to the Jewish community. TBI elected both Barbara and Karen for the time and effort they have both have put in for the benefit of the temple as well as the community at large. They have worked on publicity for the temple’s We Care concerts (which donate the net proceeds to deserving local non-profits) and the Jewish Food Festival (both cooking and doing PR for it…it attracts about 600 people yearly), as well as other activities for the temple and the community.